ProBrand: Flip is a set of 30 professionally designed logo reveals made exclusively for Final Cut Pro X . With ProBrand: Flip users can easily reveal any logo in just a few clicks of a mouse. Customizable accents settings give Final Cut Pro X users control over the style and animation of each preset. 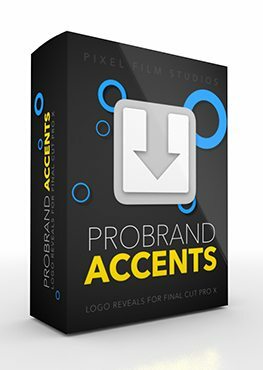 Use these presets to add a uniquely animated logo to any photos or videos. Its never been easier to create a unique logo reveal thanks to ProBrand: Flip. ProBrand: Flip includes 30 flip book reveal animations. Easily reveal any type of logo with easy to use drop zones. Editors can select from a variety of flip book animations. In Addition, users can modify each preset to fit any logo design. Also, with the included sliders and color pickers, making a unique logo reveal has never been easier. ProBrand: Flip makes displaying any logo easy and quick. Each preset includes easy to use sliders and color pickers that allow users to customize the style to match any logo. Easily adjust the scale, rotation and position with intuitive on screen controls provided with every preset. Adjust the shape backdrop type, color, scale and opacity to fit any logo ranging from corporate abstract logos to cartoon styled logos. Making a personalized logo reveal has never been easier, on account of ProBrand: Flip. ProBrand: Flip offer users a hassle free solution for revealing any logo. As a Result users never have to get bogged down with setting animation keyframes ever again. Click and drag any of the 30 professionally animated presets into the timeline and let ProBrand: Flip do the rest. Editors can easily adjust the style of background effects with easy to use sliders and color controls. Users can include their own backgrounds as well, whether it be live action or a still image by simply unchecking the provided checkbox. To conclude, making a logo reveal in Final Cut Pro X has never been easier. Where do I find ProBrand: Flip? Once the installation is complete, you can find ProBrand: Flip in the FCPX Titles library.